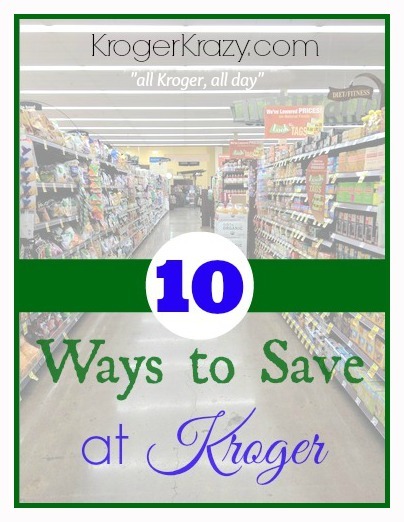 New Kroger shoppers or those of you who just enjoy friendly reminders…here are your TOP 10 ways to save at Kroger!! Please note that the 1-2-3 Rewards Visa no longer offers the $25 sign up bonus. What other ways do YOU save at Kroger? Love the video Katie. Wish I had a Kroger. I would do all your tips...especially #2! I do that with Old Navy and we get a lot of Free Clothes...but I would rather have free groceries. dillons in manhattan ks told me the other day no more overage to take off your total. so if its $2.99 and you have a $3 off coupon it wont take anymore since it exceeds the value. wasnt aware. but still ok. YES!! It's "awesome"!! :D Thanks for commenting Jessica!! Wish you had a Kroger too!! Hmmm...will they even adjust the coupon down to MEET the total April? This is a long video, so I am going to need some popcorn. However, I am out of popcorn. Perhaps I should wait until Katie posts a popcorn coupon, then rush out to buy the popcorn, then rush back to watch the video. But what if Katie mentions a popcorn deal in the video??? I'm so conflicted. I love your videos and post. I do have one question you mentioned that you do the best deals on Wednesday Mornings; is there a reason why you choose Wednesdays? The reason I ask is because I do my shopping on Tuesday because of Senior Citizen discount and I always find something I miss that you post on Wednesday. The SC discount isn't that much but like you always say get the best deals and for me that little amount adds up. Thanks love your videos. Hi Cynthia! Great question! My sale cycle starts on Monday and by posting the list on Wednesday that gives me time to scout out all of the UNadvertised deals so that he must-do deals list is complete and represents what truly ARE the must-do deals for that week. Hi Katie, The only thing is I cant print them unless I go to the library and pay to do it. Then what if I do before I go to krogers and then my prices are different. That's why I love loading them. Thanks for your help. I sure get a lot of good deals. Especially that $25 off my order. Do you know how the Cellfire digital coupons work in hierarchy with physical coupons at the store? If I load a coupon to my Kroger Plus Card through Cellfire and I buy that product at Kroger with a physical copy coupon, will it take both or just the Cellfire coupon? Thanks! I live in Louisiana. found out recently that at the age 50 you get 10 % off ALL KROGER BRANDS.that really adds up. go to service desk to sign up!! Katie: Thanks so much for the volumes of valuable info on my Kroger! Is there anyway to tell if the Catalina promotions are different by region? A couple of times, I have made the purchases as noted on your page, but haven't received the coupon (and the cashier assured me the green lite meant the machine was working!). Fortunately, the customer service desk values its customers, and they actually gave me cash because I showed them a screen print off your website. But I would like to be more prepared. Any suggestions? Hi Where can I go to get Kroger name brand coupons. Kroger was sending in the mail. But I don't know why I'm not getting in mail no more. I still do all my shopping at Kroger. Hello Can someone tell how to get Kroger coupons! you can download the kroger app on your phone and get digital coupons that way or you can also go to coupons.com and download coupons. you can also redeem coupons at kroger that say available at walmart on them kroger accepts those as well. i stopped getting them also but went to the website and made sure all of my information was updated and i just started getting them again or you can also contact customer service from the kroger site. I shop on Wed. and get 5% because I have a Golden Buckeye card. If you're from Ohio and have one, you can get a discount, too, but check with your store to find out what day they offer this. If you are looking for a rewards card that gives you a little more bang for your buck I have a few suggestions, and I already did the math for you. For those of you who spend more than $208.33 look into the Blue Cash Preferred card. The card gives you 6% CB at grocery stores, 3% at gas stations, and 1% everywhere else. The fee is $75 annually but that is covered if you spend $104.17 on groceries per month and you start saving more than a free 3% card when you spend more than $208.33. Please note that all your saving dreams don't come true with this card as superstores (Walmart, Target, etc) and warehouse stores (Costco, Sam's Club, etc). It is still the best cash back I have found. Hi! Thank you so much for the information. I am also finding Kroger is the place to shop to save a lot these days. My site shows what to look for, for even greater saving. Try what I mention in my site for your next shopping. I am sure these tips/tricks will help you save over $30 fairly easily on your next shopping. Feedback welcome! Thanks again!! Sorry I meant Kroger Krazy.I have brain damage this morning. Hi Ms. Katie your page is awesome! I'm starting to buy with coupons, but a have a question today went to Kroger to buy in the mega event and I used my Kroger digital coupons and a have a manufacturer coupons too.Can I use both at the same time? thank you for all your help in your page! I found this very helpful. Thank you so much for all the good information.